In just about every book I’ve ever read on human communication, I see the figures 7%, 38% and 55% being attributed to the three modes of communication. The three modes being Words, Tone of Voice and Non Verbal Communication or as it’s become more commonly known Body Language. Our Words supposedly convey only 7% of the whole message being communicated. Tone of Voice in which we deliver our chosen words makes up 38% of this message so a simple subtraction of 7% and 38% leaves us with 55%. This 55% is given over to our Non Verbal Communication, our facial expressions, hand movements, the angles and distance we use in relation to others and many other things all Non-Verbal. Now these figures 7/38/55 are always attributed to Albert H Mehrabian. Here’s what Wikipedia has to say about him. Albert Mehrabian (born 1939 in the Armenian family in Iran, currently Professor Emeritus of Psychology, UCLA), has become known best by his publications on the relative importance of verbal and nonverbal messages. His findings on inconsistent messages of feelings and attitudes have been quoted throughout human communication seminars worldwide, and have also become known as the 7%-38%-55% rule. However, these figures have been forever misinterpreted and they will continue to be until trainers, self-help gurus, the NLP industry and many others stop quoting them out of context without giving the full facts. The full facts are that these figures were extrapolated from two separate studies that dealt only with emotional, feeling statements. Therefore, anything that does not have an emotional state change cannot be taken as part of these figures. People will often react to things with Non Verbal communication when statements and questions have an emotional content element. IE: Something that has an emotional connection with them, something they have a feeling about either positive or negative. Therefore if there is no emotional content then whatever Non Verbal communication is being expressed cannot necessarily be considered as meaning anything. If for instance you are at work and someone comes in and says “Sorry I just hit a car in your car park”. Immediately you are likely to think “Is it my car?” so you are very likely to express some Non Verbal behaviour that would indicate your fears and if it’s not your car then you will show Non Verbal signs of relief. You might add some choice words if it is your car! Whilst these figures are not exactly what they might seem at first glance they are not far off the reality of what is transmitted through Non Vernal behaviour. When dealing with people we are all essentially trying to work out whether or not we can trust them both in our personal relationships as well as our business relationships. In the closest of personal relationships we reveal things about ourselves that we don’t necessarily want everyone else to know and if you can’t trust your partner, close friends and family to keep certain things private then the relationship is pretty much doomed. In business, which essentially consists of selling things whether it be a service, product or concept, we need to know whether the person/company we are dealing with and investing our time and money in will actually live up to what they said in their presentations. Going way back in our ancestry Man did not speak had no formal language, so understanding Non Verbal messages was crucial to our survival. Now we have thousands of different languages across the globe and if these figures were correct none of us would ever have to learn another language ever again, as we could just get by with Non Verbal Communication. Well, I know from experience you can get by quite a long way with just Non Verbal Communication but you simply cannot communicate properly with people from a foreign land without knowledge of their language. Are you aware of the expression on your face right now? Are you aware of how you’re sitting or standing, or who and what is around you? Probably not - until I asked the question and your brain went to do a little check, or you had a look round. Most people are oblivious, most of the time, to what their body is doing. If you are one of these people, you’ll be unaware just how much your body tells others about you. About your moods, emotions and attitudes. These body movements, signals and gestures, are forms of Non Verbal communication or what we commonly refer to as “Body Language”. In business, being aware of and understanding this subject, can dramatically change people’s perceptions of you – and consequently the results you achieve. This book takes you through everyday business situations, pointing out what to observe, what to do with what you see, and how to turn it to your advantage. I start right at the beginning with what body language is, and then take you through greetings, meetings, presenting, selling, negotiating, managing, leading and all the other key areas you need to understand in your business to make the best decisions, and be successful. Over the course of this book, I’ll cover all of the situations and common behaviours, just as you would encounter them in your business and your personal life. By the end, you’ll be an expert at interpreting what body language means in different situations, and you’ll have a range of techniques and approaches to deal with the people depending on the signals you see them exhibiting. Body language is everywhere. We are all affected by it through our interactions with family, friends, colleagues, shop and restaurant staff, Government officials like police and traffic wardens. They all send us silent messages that tell us things about them, their job and how they feel. We can all remember certain characteristics about people we’ve come into contact with throughout our lives: a particular teacher who had a funny walk when you were knee high to a grasshopper; a friend who always had their hands tucked up their sleeves when you were a teenager; or that bloody woman who kept clicking her pen at a meeting and annoying the hell out of you as you were trying to speak. And, whether we like it or not we all react to these Non Verbal messages. Sometimes we think about them consciously, other times we don’t. Just because we don’t consciously think about them doesn’t mean they don’t have an effect on us! Think for a moment about power and status. You walk in to just about any Foreign Embassy anywhere in the World (if you’ve not been in one then I’m sure you’ve seen them in films or on TV). What are you immediately greeted with? Usually the first things you see are the flags. At least one, if not several, huge flags right smack bang in front of you as you enter the building, and then dozens of others of varying sizes dotted around the place. Often you’ll see the country’s emblem on pictures of beautiful places. You’ll see people in smart military uniforms or other security staff. Then there’s other things like security gates, car parking spaces marked for ‘Visitors’, others marked out especially for the important people who work in the building who may have their own names, initials or titles painted on their space, or, if they’re really going for it, their own little etched plastic sign. Why is all this there? OK so I’m exaggerating, but you get the point. We’ve grown up with Non Verbal messages all throughout our lives. We learn them from the people we’ve met, especially from people we view as important to us, or have an influence on our lives; Parents, grandparents, siblings, extended family, friends, teachers, sports coaches, Cubs, Brownie, Guides leaders, etc. We learn as we grow up from all the different people we meet, the situations and circumstances we’ve been in, and the results of those interactions. Sometimes we take it in at a conscious level, sometimes it’s totally unconscious. Your own Non Verbal communication is both conscious and unconscious too. Sometimes you know exactly what you’re doing and have free choice. Other times you haven’t got a clue, you’re not even aware of the signals you’re sending out. But just because you’re unaware of them, doesn’t mean others haven’t picked them up. In fact most of what you do with your body is completely unconscious most of the time. Micro expressions flash across your face in less than half a second, but that’s enough for someone to realise things are not what they seem. Hopefully as you read through each chapter you’ll start to notice the world around you more. You’ll start to pick up on the Non Verbal messages you get sent day-in, day-out by people and places. You’ll understand that Non Verbal communication is not just about physical body movements, signals and gestures. It’s all that and much more. Body language has taken over! Unfortunately, the term ‘body language’ has become the sweeping name for all Non Verbal communication. The problem with that is that most people interpret it as applying only physical body movements. You don’t hear people say, “Did you see his/her Non Verbal communication?” No, instead they say, “Did you see his/her body language?” It basically means the same thing, although it’s a more limited expression. “They left the Magistrates Court with their head down to avoid eye contact with the waiting press”. “She was all smiles as she walked confidently waving to the waiting crowd at the premier of her new film”. Non Verbal communication is just as it sounds: unspoken messages that have meanings behind them. By systematically breaking down these messages you will learn to read people and situations better, improve the results you achieve and benefit from the ability to decode what is really going on around you. Kinesics - The term anthropologist Ray Birdwhistle first used in 1952 for his studies on how people interact through their body signals, movements and gestures. Proxemics – A term coined by anthropologist Edward T Hall back in 1966 referring to the study of distances between people interacting with each other. By the time you get to the end of this book you’ll realise just how much actually comes under the heading Body Language. Discover the secrets of body language. Use that knowledge to make presentations better than ever. Determine how to differentiate between truth and lies in real time. Recognize when someone is attracted to you! Generate sexual and romantic interest in someone you desire. Portray confidence and command respect in any situation! Build a sense of trust! Our bodies are capable of producing over 700,000 unique movements. We draw from those movements each time we communicate. The adage “actions speak louder than words” certainly applies to the way we interpret those actions when we’re interacting with others. As much as 90% of our communication at any job interview, public speaking engagement, negotiation, or even our romantic encounters are conveyed non-verbally. The concept behind our body language cards was to translate those movements into a visual tool that would aid in creating targeted communications using brain studies introduced in the cortico-limbic theory. We want to help you educate your “thinking” brain (neo-cortex), using information that is already inherent in your “emotional” brain (limbic system). Our body language cards were created to help you recognize the most common movements, and how to use their meaning to your advantage. 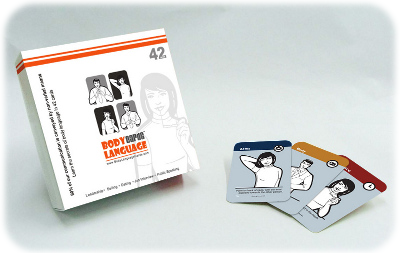 Body Language Cards use flash card methodology to introduce the basics of body language and the general concepts of how to read and understand body language. We chose flash cards because they offered a visual learning experience and body language is a visual experience. We also offer several more specialized products that can be used for specific activities such as public speaking, negotiation, multi cultural communication and dating. In addition, we provide web-based training tools and applications to help you increase your knowledge of body language, and to apply the skills introduced in our products. Learn all the secrets of Body Language and Non Verbal Communication in cards! We’ve all been in that place. You have a pretty good idea what must be done, but you can’t do it. You know it is the appropriate thing to do, but you just can’t act. You are stuck. You mull the circumstances over and over in your head, but still you don’t really do anything about it. You wait…wait for life to come along and work it out for you. Then you accept the outcome. There are times when this approach might be okay, perhaps even the best choice; but most of the time we just don’t have the courage to make a decision. That’s what it boils down to, you know…courage. Well, I know that’s the case for me anyway. I have taken to examining myself at such times when I find it difficult to decide what best to do. My discovery is that, even when it is abundantly clear that one action is for the greater good, fear stops me from acting of my own will. I look at the “possible” consequences and I can’t bear to move forward. What about the other action? Well, the fallout of that might also be unbearable, so I don’t take that action either. I can’t stay where I am. I must do one of the other. Repeatedly I return back to the same fork in the road, and I don’t act on either one, hoping that the next time I return there would be more clarity. Sadly, clarity hardly comes. Eventually, when I do act, a lot more damage has been done than was necessary...damage that could have been avoided if I only had the courage to act sooner. Well, more damage isn’t always done, one could argue. It’s true. Still, at the very least, you take away your control of the situation by becoming a victim. Surely that’s wrong, you say. What if you rush into a decision that you later come to regret? Wouldn’t it be better to consider things fully before you do something stupid? Once again, that’s correct. However, for most people, the consideration goes on for way longer than it should. If there is something else that should happen first, then that’s fine; but this is not the case either, for most people. It’s just that they don’t want to do what is necessary. Making decisions is a key activity in taking control of your life. It’s a skill in itself. Some people seem to have the ability to do it better than others. For these people, it seems to be an innate ability. For others, well it requires development. You have to practice. You have to flex those “decision-making” muscles. You can’t afford to wait around for things to happen. You have to confront your fear...fear of failure and of missed opportunities. In order to develop the ability to act when the situation demands it, it’s ironic that the best ally is a more “passive” resource. It’s acceptance. When you can learn to accept life, then you are able to do more without being paralyzed by fear. Think about it. You can’t control everything. This is a fact. You can’t see the future (unless you are psychic or something, in which case skip this); another fact. You will make mistakes in life; but you can recover and move on. Accept all of this and you’re well on your way to being able to make tough decisions. Acceptance is not so difficult. You do it all the time. Do you drive? Well, if you do, you have to take it for granted that the driver coming from the opposite direction is not a lunatic who is going to run into you. If you’ve ever crossed the street at a Traffic Light, or gotten in a car with someone else driving, then you’re doing a lot of accepting. How do you do it? Well, you don’t have a choice. You have to get to where you’re going. You wouldn’t get there if you refuse to get in a car because you are afraid you might crash. It’s a risk you have to take because you are convinced that it there is almost no choice. Well, how about applying that acceptance to your decision? There are no guarantees in life (generally speaking). You might have made a mistake, but at least you had the courage to choose. And who’s to say you wouldn’t have gotten struck by lightning if you had taken the other path. You just can’t know that it would have been better if you hadn’t acted as you did. Accept this as well. It will give you confidence. Trust me, with confidence; you are already half-way to your destination. So step up to the plate. Choose. Don’t be a victim of circumstance. You can do so much more knowing that you are responsible for the choices that have delivered you to where you are in life. How Can Men and Women Handle These Differences?